Amusement Emporium Inc., Crystal Leisure Inc. and related companies and divisions have been serving the parts needs of companies for nearly forty years. Our management comes from the industries that we serve. Our account managers are trained in, and perform exclusively within one division of the total organization. 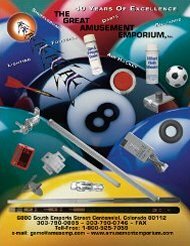 We distribute and manufacture a wide range of products for the billiard, dart, foosball, air hockey, shuffleboard, electrical, pin game, jukebox, and video game markets. Our new catalogue is totally reorganized with more information, logical product flow and with an index to maximize the ease of ordering. Hundreds of new products from numerous new and top-quality manufacturers highlight our product line. We sell exclusively to companies that we verify are within these industries. © 2010 - 2014 Amusement Emporium Inc. All rights reserved.